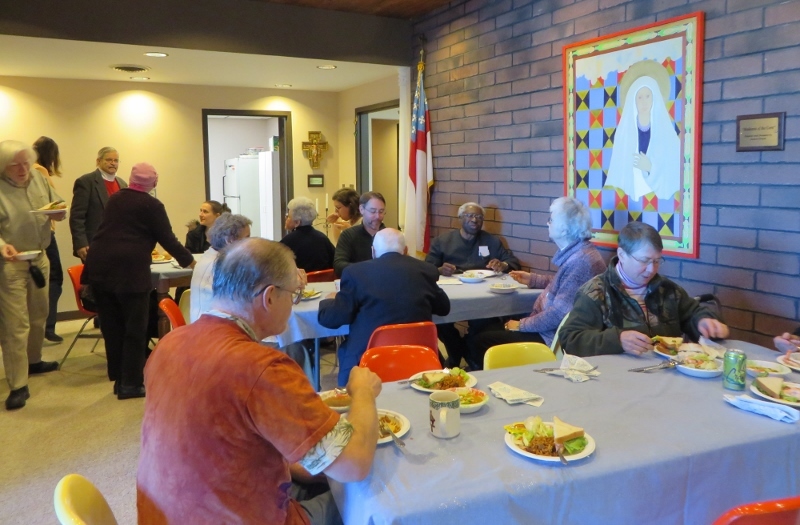 The Episcopal Church of St. George is made up of a variety of folks--families, single people, college professors, graduate students, retired people, and those working in other professions. We are a supportive group that gains strength from worshiping together and socializing together. We are one of the churches contributing to the Loaves and Fishes food pantry, which serves many families in McDonough County. Pictured above are some members celebrating The Rev. Paula Engelhorn's ordination in December of 2011. The folks below are our Bishop's Committee: from the left, The Rev. Paula Engelhorn, Edie Selders, Lisa Allyn, Angela Ferree, Bishop's Warden Katharine Pawelko, Tom DePauw, Janie Torma, and Clerk Janna Haworth. Morning Prayer is said on Wednesdays at 10 am. The format is taken from the Book of Common Prayer with readings from the daily lectionary. Afterwards, we discuss the readings and The Rev. Paula offers a healing service. We are a very social group. In the picture below, Marietta Dean Weston, Darryl Roberts, Tom DePauw, Igolima Amachree, and The Rev. Paula enjoy a barbecue lunch. Following each Sunday service, we enjoy coffee hour conversation. At left Janie Torma displays her treats for coffee hour. In the center, visitors from Grace Episcopal Church in Galesburg visited us. On the right Katharine Pawelko chats with Luciana Hontila, Samantha Flores, and Dayoung Lee. The picture below that one shows us enjoying a soup-and-sandwich lunch after our annual meeting on January 17th.